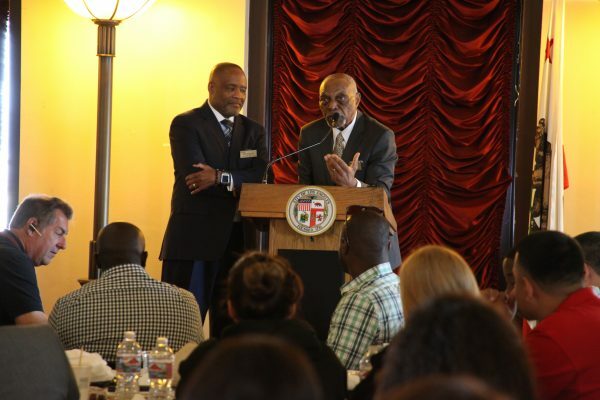 Having grown out of the 1992 Los Angeles civil Unrest, the USC Center for Religion and Civic Culture and Cecil Murray Center for Community Engagement commemorated the 25th anniversary with multiple opportunities to reflect on the past and look toward the future. The USC Cecil Murray Center hosted “A Day of Interdependence” with the Los Angeles Mayor’s Office of Public Engagement. L.A. West Media, Voice of America News and numerous TV and radio stations reported on the event, where Mayor Eric Garcetti and Chief Charlie Beck, along with other city, police and community leaders, signed on to Rev. Cecil Murray’s Declaration of Interdependence. USC Murray Center staff were go-to sources for many news outlets that produced stories related to the 25th anniversary of the civil unrest, also known as the L.A. riots or L.A. Uprising. Murray and Rev. 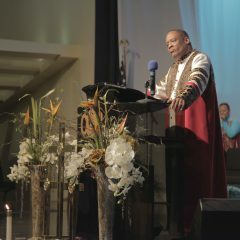 Mark Whitlock, executive director of the Murray Center, spoke of the pivotal role that First African Methodist Episcopal Church (FAME) played in quelling the violence and leading efforts to rebuild South L.A. after the riots, which left at least 60 people dead and caused $1 billion in property damage. Murray was the pastor at FAME for 27 years, and Whitlock served as the executive director of FAME Renaissance, which brought more than $400 million in investment to South L.A. Today, Murray and Whitlock apply the lessons learned from their work at FAME to help equip other faith leaders to empower their communities at USC. In addition to stories at the media outlets below, several new documentaries–including “Let It Fall” by John Ridley, John Singleton’s “L.A. Burning,” The History Channel’s “The L.A. Riots: 25 Years Later” and “LA 92” from National Geographic–examine Murray’s faith-based community activism along with other dimensions of the 1992 civil unrest. Some of the outlets that quoted Murray and/or Whitlock: National Public Radio, CNN, The Los Angeles Times, NBC News, Fox L.A., CBS Los Angeles, Orange County Register/Whittier Daily News, L.A. Daily News. CRCC also launched the Murray Archive, posting Rev. Murray’s sermon from May 3, 1992. Bits of that sermon can be heard and seen in the National Public Radio and CBS stories. Click here for the full second panel.